‘UFO’ | Florida Foundation Seed Producers, Inc. Description: ‘UFO’ is a non-melting-flesh, peento-type peach with a unique donut shape. It was patented in 2002 and produces large, vigorous trees with a semi-upright growth habit. ‘UFO’ produces moderately heavy crop loads of large, firm fruit with yellow flesh and semi-freestone pits that have an FDP of 95 days. The skin develops 50–70% blush. 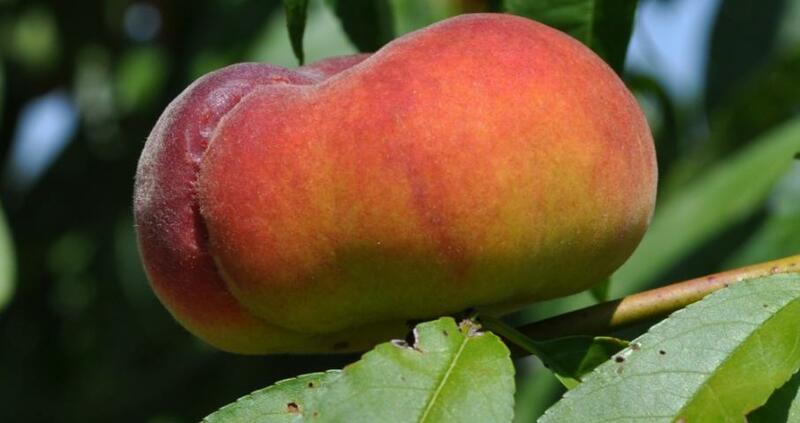 This cultivar is particularly susceptible to ethylene that is released during dormant pruning, which can result in significant flower bud abortion, thus, pruning is only recommended during the summer period.